I made you holy by the once for all sacrifice of My Son, Jesus Christ. I love the finality of this promise. 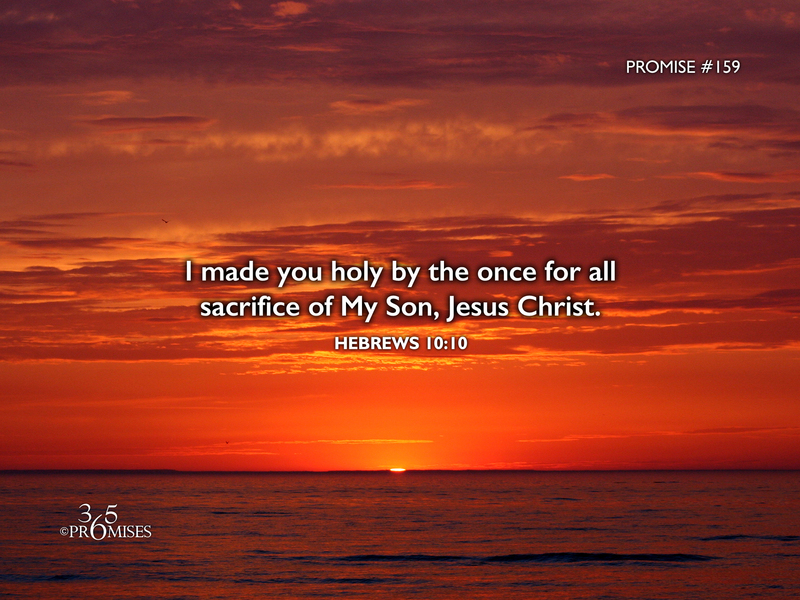 We are made holy by the once and for all sacrifice that Jesus made on the cross. The price He paid two thousand years ago covers our past sins, our present sins and our future sins. There is nothing else that needs to be paid or could be paid. As Jesus cried out on the cross, "It is finished!" Hallelujah for such a promise! Our sanctification is secure for all eternity because of the finished work of our elder brother, Jesus Christ! As Paul says in Romans 8:1, there is therefore now no condemnation to those who are in Christ Jesus! What a glorious promise. Sometimes it is easy for us to vacillate between living in the forgiveness that God has already given us and feeling guilt and shame. The blood of Jesus has settled this issue once and for all! All we need to do is simply accept this free gift and walk in the assurance that we could never add anything to the amazing, extravagant gift that God the Father has already given us. When I think of the permanence of Jesus' sacrifice, and how my redemption and sanctification has been secured for eternity, it brings me into a reassuring peace and rest knowing that when God looks at me, He doesn't see all my sin and my shortcomings. ...He sees me through the once and for all finished sacrifice of the spotless Lamb of God. What good news!